From the makers of cop series Luther, there is Hard Sun, in which two radically different detectives have to team up to in a pre-apocalyptic world of crime. Where can you stream Hard Sun? On 2018-01-06 Crime/Drama TV Series Hard Sun first aired on BBC One. 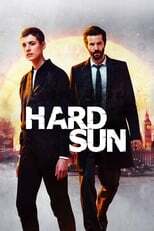 Written and created by Neil Cross, and produced by Euston Films Limited, Hard Sun will return and was last broadcasted on 2018-02-10.